Last year Maria McCambridge, preparing for a spring marathon a few weeks later, came to the Ballycottton in superb shape. Her new course record of 54 minutes 48 seconds was so good that she finished 16thh overall in a strong field. McCambridge’s time of had knocked 40 seconds off the mark set by British international athlete Marian Sutton 15 years earlier when she was pushed hard by Clonliffe’s Cathy Shum, who finished just a second behind. Can she do it again? After the disappointment of not making the London Olympics, McCambridge went on to win the Dublin Marathon last October in 2:35.28 – a personal best by one second. A stalwart of the Marathon Mission, McCambridge hopes to knock a few minutes of that time when she runs the Rotterdam Marathon on April 14. Although she is in heavy training, she ran 33 mins 38 secs to win the Enniscorthy 10km a few weeks ago. With Lizzie Lee – second last year in a personal best 57 mins 17 secs – concentrating on the World Cross-Country at the end of the moment, Clonmel’s Angela McCann, second two years ago and Siobhan O’Doherty of Borrisokane, second in 2010 are McCambridge’s two main rivals. Newly crowned national cross-country champion Sergiu of Ciobanu from Clonliffe goes for a hat-trick of wins in the men’s race. Since he came to Ireland, Ciobanu, a prolific racer, has become a Ballycotton” regular”. He finished second in 2008 before his wins of the past two years, both of them in under 50 minutes. A strong group from the Marathon Mission has signed up although flu-striken Sean Hehir is doubtful. Tallaght’s Tomas Fitzpatrick, the form man of the moment, has withdrawn with injury. That leaves the way open for Brian Maher, the Kilkenny farmer who showed some of his old sparkle when finishing second behind Fitzpatrick at the Enniscorthy 10km. There’s also a welcome return for Bantry’s Alan O’Shea , the 2007 winner, fresh from a warm-up victory in a local race in Inniscarra last weekend. At his best. O’Shea can dip under 50 minutes. Making his Ballycotton debut is Michael Mac Diarmada of Clonliffe, while a committed Raheny squad makes its annual visit to Ballycotton and hopes to retain the team title. 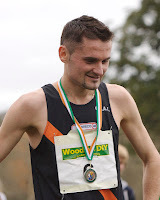 Leading the local entry is James McCarthy of East Cork, who last year produced the best performance by a local athlete in many years when he finished third. .
After her confidant win at the Woodie’s DIY National Interclub Cross-Country Championships in Tullamore, Ireland’s chances of a medal at the World Cross-Country Championships ar eimproving all the time. Cullen will join double European champion Fionnuala Britton on the strongest Irish team for many years. Add to that the marathon strength of Linda Byrne, Lizzie Lee and Breege Connolly and anything is possible. Cullen, who like Britton is now coached by Chris Jones, was in a league of her own last Sunday in Tullamore even if both Britton and Lee were absent. Clonliffe’s Sergiu Ciobanu was a deserving winner of the men’s race after a long tussle with Joe McAllister; McAllister was only top six finisher from the National Intercounty Championships to run. When it came to the teams, Raheny Shamrock took their first women’s title in over 40 years, while Clonliffe extended their winning streak. Dublin clubs dominated a once pivotal day of sport that is is bad need of a re-vamp. With the spring marathon season looming, Barbara Sanchez of Raheny Shamrock and the Marathon Mission made an early start at the Seville Marathon in Spain, where he clocked a time of 2:37.14, knocking four minutes off the time she ran to win the Copenhagen Marathon last May. Next up for Marathon Mission athletes is the Paris Marathon on Sunday April 7. National indoor hurdles champion Sarah Lavin, who broke Derval O’Rourke’s junior 60m hurdles record recently, finished second with a time of 8.39 in the U20 60m hurdles at the English Athletics U15,17,20 Championships in Birmingham. Lavin had won the 60m a day earlier. Young pretender Molly Scott from SLOT Carlow won both U15 60m and 60m hurdles while David McDonald of Menapians won the U15 long jump. Five days of hectic “indoor” competition ended for Dublin Juveniles in Santry with some very good performances. Huge numbers in all events put considerable strain on the timetable, especially at Saturday’s relays held at an Arctic Tallaght with about 170 teams from clubs all over the county in action.